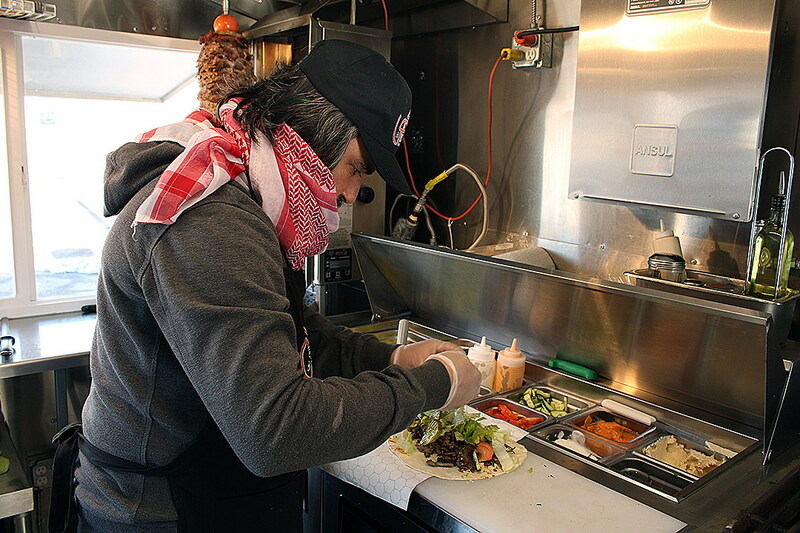 Entrepreneurial Iraqi refugees have joined the local food scene in Missoula, selling Arabian cuisine in the Imagine Nation Brewing Co. parking lot. Kamoon Arabian Cuisine began in 2017 when cousins Ammar Omar and Wisam Raheem realized that Missoula was missing the authentic foods found in Iraq, their birth country. “We really bring the original taste to Missoula,” Omar said. The cousins offer chicken and beef shish kebabs, falafel, and chicken and beef shawarma. They also offer a catering service that includes appetizers and desserts. Shawarma, one of their best-selling menu items, is meat cut into thin slices and stacked in a cone shape on a vertical rotisserie. 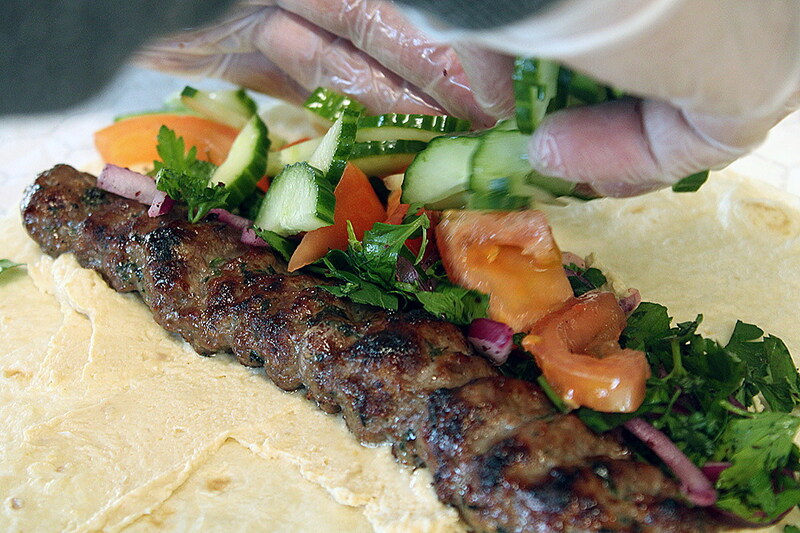 The meat is carved off and made into a wrap, placed on pita bread or served alone. The pair uses local beef from Hamilton or Superior, coupled with a marinade made of 25 different spices. The word “kamoon” means cumin, a spice used in many Arabian dishes. “We are serving shawarma only on the weekends because it will take time for preparation – more than 16 hours to do these skewers,” he said. The co-founders came to Missoula as refugees from Iraq, supported by Soft Landing Missoula, an organization that assists and welcomes refugees to the city. They started selling food at the farmers market, then began catering. 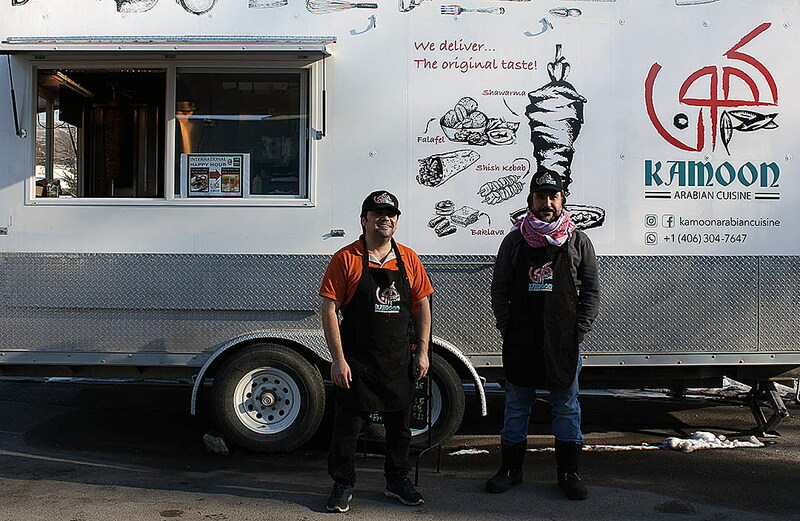 As their offerings gained popularity, they decided to buy a food trailer in early December 2018. They remodeled the food trailer to accommodate their cooking, and asked the owners of Imagine Nation Brewing Co. to use the parking lot as a permanent place to serve customers. The two businesses have collaborated over the past month, and the brewery started an early happy hour that offers discounted beer to bring in customers during lunchtime. Fernanda Krum, co-founder of the brewery, was happy to help Omar. “We feel very grateful and honored that he felt that this was the place that he wanted to be,” Krum said in a previous interview. Omar and Raheem serve about 50 to 60 people per day, and go through about 60 pounds of meat in a day. “All of our food, from a to zed, is made from raw material. For example, we buy the beef, we slice the beef, we marinate the beef, we put it on the skewers – the same as the kebab,” Omar said. The business has seen success so far and Omar and Raheem hope that more people will try their dishes and experience authentic Arabian food. “When we moved to Missoula, we found out there was no Arabian food here to bring the original taste to the Missoulian people. There are not a lot of Arab people here, so we believe that not many people have tried the original Arabic taste,” Omar said.